Palestinian leaders are betting their future on President Donald Trump being impeached by Democrats following the mid-term elections, according to Arabic language comments by a senior Palestinian government leader who praised Special Counsel Robert Mueller for targeting Trump and his top allies. Palestinian government leaders, under pressure from the Trump administration as it slashes U.S. taxpayer aid to the embattled government, say they are betting on a Democratic takeover in Congress that will stall the administration's agenda and put the still languishing peace process on the back burner. Muhammad Shtaya, a member of the Fatah government's Central Committee, said regional officials are counting on Democrats winning the midterms and seizing control of Congress, a scenario the Palestinians believe would work in their favor as the Trump administration pursues efforts to isolate regional governments for their support of terrorism. The comments come amid a new push in Congress and the Trump administration to slash U.S. taxpayer aid to the Palestinian government as a result of it spending this money to pay the salaries of terrorists and their families. Parallel efforts in the United States also seek to redefine how Palestinian refugees are classified, a move that would change the calculus on peace talks. Shtaya said in Arabic language comments that many are waiting with anticipation for Democrats to win the midterm elections. November "is the midterm elections for Congress and the Senate," Shtaya said, according to an independent translation of his remarks provided to the Washington Free Beacon. "If the Democrats seize the majority in Congress and the Senate, I believe we will arrive at two results: First, the first result, a total paralysis of the Trump administration, as he will not be able to pass any bills in Congress. And second, and he spoke about this the other day, and he is the first American president to say, if I'm impeached, the world markets will collapse and everyone will pay a price for it." The ongoing Mueller investigation also has provided a lifeline to Palestinian leaders who are hopeful it will erode Trump's presidency. "I believe that the investigator Mueller is proceeding with a bottom-up strategy, and he's gradually tightening the noose on him, because, in any case, the principal problem is that America's interests worldwide have become to be negatively affected, and the weight of the United States in the world has begun to diminish—it's not collapsing, but it's diminishing—and the adversarial camp to the U.S. is expanding," Shtaya said. 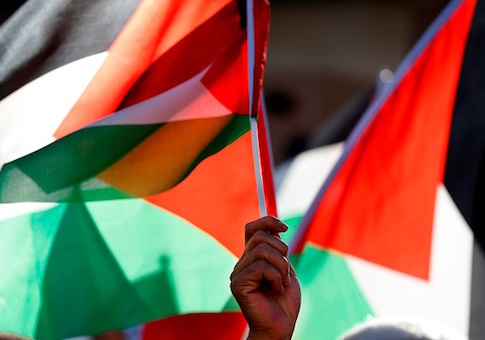 "Because for us, the nations of the world who stood with us at the [United Nations] did not just stand with Palestine, but also with their own interests." Shtaya's remarks indicate the Palestinian government is feeling the pressure following the Trump administration's decision to cut some $200 million in aid to the Palestinians as part of an effort to tighten the noose on its terrorism funding against Israel. The administration also is contemplating pulling U.S. funding for the United Nations Relief Works Agency, or UNRWA, a refugee aid body long accused of harboring anti-Israel bias and of aiding Hamas terrorists in the Gaza Strip, where it operates schools and other facilities. "That money at this time is not in the best interests of the U.S. national interest and also at this time does not provide value to the U.S. taxpayer," State Department Spokesperson Heather Nauert told reporters on Tuesday, referring to the $200 million aid reduction. "The Palestinian Authority, the Palestinians and Hamas [are] the primary reason why the security situation and the situation in Gaza is so terrible, why electricity has become an issue, why clean water has become an issue, all of those things. And Hamas needs to take care of its people. It has refused to do so. Instead, it has spent money on other types of projects, and you know exactly what I'm talking about." Asked about plans to defund and possibly dismantle UNRWA, Nauert said that no final decision has been made by the administration. Meanwhile, leaders in Congress are pushing efforts to cut UNRWA's funding and retool the organization, according to officials in the office of Sen. Ted Cruz (R., Texas). "Senator Cruz has long called for cutting the counterproductive funding the United States provides to the Palestinians, including and especially UNRWA, which promotes anti-Semitic incitement and lashes out against America," a Cruz spokesperson told the Free Beacon. "He will continue to push for reducing such funding until it's in line with America's national interests." The anti-UNRWA push comes on the heels of a Free Beacon report disclosing the State Department continues to classify what insiders have described as a bombshell report busting the myth of Palestinian refugees. While UNRWA is awarded international aid dollars to care for some 5.3 million Palestinian refugees, the classified report puts the number at closer to 20,000. Lawmakers say the report has been inappropriately classified in order to obfuscate the findings and keep them from public view. This entry was posted in National Security and tagged Donald Trump. Bookmark the permalink.